Contour Heating Products Ltd > News > What Are LST Radiators? In environments that are regulated for working and surface temperatures, LST radiators are often the first point of reference for compliance and safety. But what are they? Contour has been blogging about LST radiators and how they work to create a safer heating solution for schools, hospitals and commercial environments. LST stands for low surface temperature. A low surface temperature radiator is one that stays within a certain temperature boundary to meet the recommended safety standard. 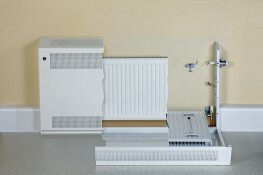 LST radiators are comprised of two elements; the radiator and the radiator cover. The LST radiator is designed to maximise the heat output into the room while creating a safe space where the risk of burns and scalds is reduced for anybody coming into contact with them. Contour LST Radiators are designed with a safety first and customer focused attitude. We provide safer heating solutions for schools, hospitals and care homes through close concentration on where radiators can be improved for maximum safety. In hospitals, there is a growing concern about the presence of potentially harmful microbes such as MRSA and E.Coli. In schools, there is a drive to improve absenteeism through the creation of more hygiene conscious features. To drive better hygiene standards, Contour LST radiators are coated with BioCote® anti-microbial technologies. BioCote® helps to inhibit the growth of potentially harmful bacteria that could otherwise grow on the surface of an LST radiator. We understand that a one-size-fits-all approach isn’t going to suit everybody. To cater to our customer’s requirements, no matter what they are, we offer a bespoke service to ensure that our LST radiators are an exact fit for your spaces. We can even offer vertical LST radiators for smaller spaces. LST radiators are low surface temperature heating solutions that offer a safer method of temperature management for specific environments. They are particularly beneficial in commercial settings such as residential care homes and nurseries. Contour LST radiators are designed on a bespoke basis in line with the needs of the customer. This means that they will always be the ideal solution no matter what the requirements of the space. Additionally, Contour LST radiators are coated with BioCote® anti-microbial technologies to inhibit the growth of potentially harmful bacteria such as MRSA and E.Coli. No matter what your requirement for safe, low surface temperature radiators, Contour Heating can work alongside you to create it. Would you like to find out more? Get in touch today!